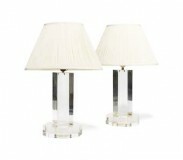 A pair of substantial acrylic lampbases by the Spanish designer Duarte Pinto dated to the 1970’s. Square column on an octagonal base at 44cm high. Lampshades are for illustration purposes only. We are able to make a pair of pleated or non-pleated lampshades for you in any of 50 shades of dupion silk, satin or linen. Lampshade shown is a standard, but we are able to make Drum, French Drum, Square, Box shaped shades. 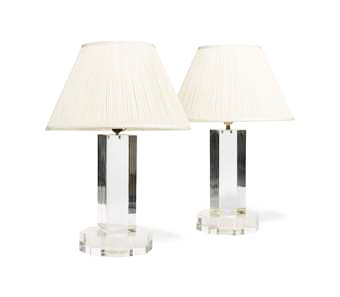 To ask a question about the Pair of Continental Acrylic Lampbases click here. We'll email you the answer as soon as possible. If you have a question about the Pair of Continental Acrylic Lampbases, fill in the form below and we'll email you the answer as soon as possible.